ELAD Canada is proud to present Dream Tower, the third tower at Emerald City. It joins Emerald City 1 and 2 in this extraordinary community. Following on the success of Emerald City’s first tower, Dream Tower is destined to become North York’s most eagerly anticipated address. Heralding all of the features of the first tower and more, Emerald City will have easy underground access to the Sheppard subway as well as Fairview Mall and a host of exciting lifestyle amenities including a beautiful park. The incredible amenities at Emerald City’s newest building have been designed with cutting edge precision to ensure a lifestyle that is unique, active and lots of fun. Plans include a sumptuous Spa with a pristine indoor swimming pool and soothing whirlpool for year round enjoyment. A state-of-the-art gym and exercise facility will be well equipped with the latest in equipment. And a Zen-like Yoga Studio will offer residents a place to get in touch with their chakras! Outside, a magnificent terrace that borders the entire amenity space is lushly landscaped, delightfully furnished and will provide the perfect venue for outdoor relaxing and entertaining. Emerald City will provide residents with an exceptional venue for elegant hosting. A luxurious party room and an inviting, intimate dining room with hosting kitchen will allow residents to entertain in grand style, while a Lounge with wireless internet connection is the perfect place to surf in peace. A private Theatre furnished with the latest in home cinema equipment, a billiards room and a cards area add to the recreational package. Overnight guests will be beautifully accommodated in the hotel-style furnished guest suite. Emerald City is also about convenience. With its easy underground access to the subway, you can catch your train without trudging through ankle-deep snow. Enjoy getting to anywhere in the city within minutes PLUS easy access to Toronto’s popular Fairview Mall, accessible from your condominium building, you are just a short walk away from stores, restaurants and cinema. There isn’t a better place to live in North York. At Emerald City, you can enjoy spectacular views in every direction. To the south is a stunning panorama with the CN Tower and downtown highrises in the far distance. 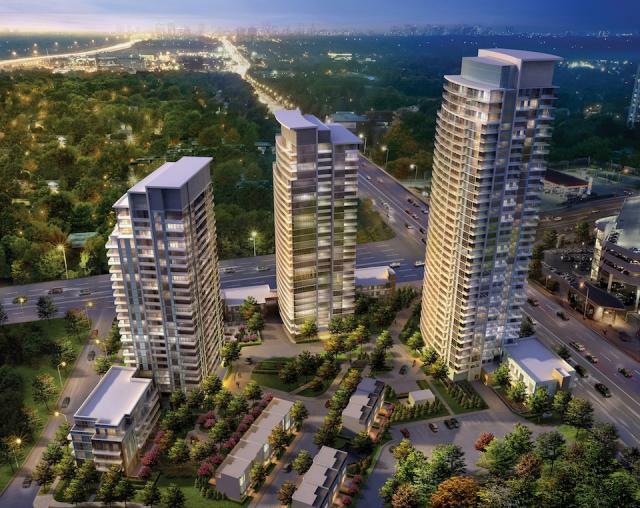 To the west you're overlooking the beautiful Don Valley ravines and parklands. To the east and north are vibrant neighbourhoods, with pockets of greenspace to delight the senses. Wherever you look, the views are simply marvellous. Dream Tower at Emerald City is a stunning condominium residence featuring 25 floors comprised of 1 bedroom, 1 bedroom with den, 2 bedroom and 2 bedroom with den suites. With airy 9’ and 10' ceiling heights, every suite at Dream Tower feels spacious and regal. Dream Tower incorporates superior features and finishes that make life easier and more elegant. Residents will enjoy fine appointments in bathrooms and ensuites, kitchens and principal rooms including beautiful flooring, cabinetry, fixtures and appliances. All suites have been carefully designed to maximize light and space. Emerald City’s designers are mindful of furniture layouts for real living.